What??? Are you wondering how something like that could happen? You helped a down, seriously ill animal owned by a neighbor. You lived across the street. You visited the suffering horse on the neighbor’s property with knowledge of the neighbor’s caretaker for most of two days. You brought blankets and water to the horse. You sat by the horse and comforted it. Your interventions resulted in a vet evaluation, and the vet recommended euthanasia, but because the owners were unavailable and the house-sitter couldn’t make this decision, the vet left. 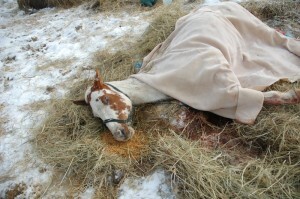 You made numerous calls and sent phone pictures to the authorities to get help for the horse. You finally succeed in getting the suffering horse humanely euthanized by asking the state representative of the Humane Society of the United States to call the sheriff to politely request intervention by law enforcement. The vet comes back and finally ends the horse’s suffering. Then a day later, you go back to your neighbor’s house to pick up your blankets and are told by the caretaker that you are not allowed on the property. HUH? Shortly afterward, you are notified by law enforcement that you have been charged with two counts of trespassing!!! What is wrong with this scenario! How can you be charged with trespassing? You were helping a neighbor’s sick animal. You were never told by the caretaker to stay off the property during several visits. In fact, you believed your help was welcomed. You knocked on the door when you visited to alert the caretaker that you were there, and he participated in conversations about the sick horse. He walked out with you to visit the horse. The property was not posted with trespassing signs either. If you cross the street and provide help to a neighbor’s sick or injured animal on their unposted property, can you later be charged with trespassing? I’m afraid to learn the answer to that question! Find out on June 10, the court date, in Tigerton, WI. A demonstration asking that trespassing charges be dropped and animal protection laws be strengthened is planned for earlier on the same day. Read more about the case and demonstration here. Can you spare $5 or $10 for legal expenses? Thank you, readers, for any contribution. This is a case that strikes at the very heart of being a Good Samaritan for animals.